Skiwerx is for active kids age 9-15 that want to learn a variety of training skills (speed, strength, endurance, flexibility) to help them become successful and happy endurance athletes in the future. The overall objectives of the program are to assist children in the development of a love of the outdoors, a healthy lifestyle, excellent technical skills and a good level of physical fitness within a sport environment. Skiwerx uses the MYSL philopshy of learning through games and fun. MYSL organizes the Hoigaards Team Sprint Series on Wednesday nights in Jan and Feb.
LATE WINTER Skiwerx graduates: For prior Skiwerx athletes coming off of their high school season. Please join us for more skiing and to help mentor the younger kids. No charge. Select Skiwerx Series entry fees are included! Check the schedules and email Amy with questions! Any season is a great time to start. Skiers need running shoes and helmets in the spring, summer and fall. Please try to register at least two weeks before the session starts. Please be aware of the equipment requirements for the winter programming. Skiers must own their equipment or MYSL provides limited rentals, but you will need to plan ahead (in November) to arrange for equipment at our rental day or shop at the MYSL Ski Swap. 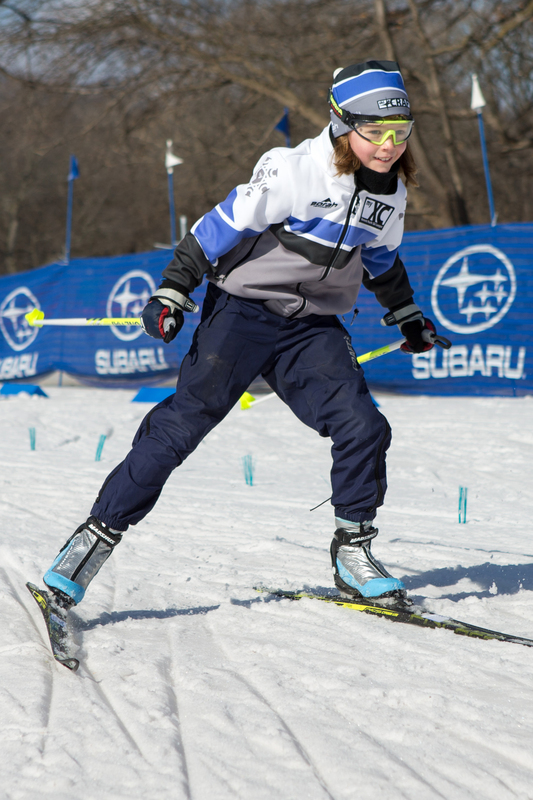 SAVE THE DATE: MyXC Festival and Championships will be March 14-15, 2020 at Wirth Park as part of the FIS World Cup Parallel 45 Festival. World Cup Sprint event is on Tuesday March 17, 2020. *Workouts focus on fun and include a variety of speed work, agility drills, strength and flexibility, as well as endurance training. *Rollerskis not required or the main focus. *Each group has a dedicated and certified coach with prior coaching/collegiate racing experience. Ratio of 1:8. *Session length is 1 hour 30 min. *Waxable classic/skate ski rental program. In the summer and fall we rely on public facilities to hold our practices. We do not have access to indoor training spaces. Hence, we have a weather cancellation policy. In the winter, we do have access to "chalets". We will hold sessions in most weather conditions, so proper clothing is very important. We will try to make cancellation decisions 2 hours before a session begins. 40 degrees or colder and raining. Cancelled session. 40 degrees or colder and misting. Shortened session. Air temp of -5 degrees (without windchill). Cancelled session. Windchill of -8 degrees. Depends on wind direction and trail availability. Session may be cancelled or shortened. We are using the Canadian Long Term Athlete Development (LTAD) Research as the basis for our training methods. Click Here for a plethora of information. The Skiwerx program fits into the "Learning to Train" stage, which is a critical time to learn "physical literacy" which gives children the platform they need to become successful athletes as well as the necessary skills they will need to remain active and healthy for life. See the MYSL Program Options PDF below for our version of the LTAD matrix.